Nearly four years ago she bounced into my life in a dress with a bright red sash. She tentatively called me Mommy after having not known one for nearly her entire five years of life and all signs of trauma were quickly masked with little girls songs and dances and giggles as she adjusted to life in a family. Years later I watched her feet run in bright red sneakers toward the towering swing set where she would pretend to fly. We had struggled for joy and were finding it; she had thrashed against love and by God’s grace I was learning to hold on tight. She kicked and screamed and did the unspeakable and when logic said that I should be angry or might love her less, I couldn’t and my desire for her was only stronger. And as I saw the extent of her brokenness and mine, I loved her even more. Red beads clicked around her face as she skipped into the kitchen to find her head a resting place now nearly at my shoulder, and she whispered of the wounds once covered but never healed and an unfamiliar panic crawled up in the back of my throat and settled in as it hit me, the full weight of how much we had yet to overcome. I took her face in my hands and through blurred eyes assured her, assured myself, that Jesus thought of her and her red beads and her red sash as His red blood spilled out, and because I knew that, I knew this – He would not leave us here. He didn’t and I saw progress, but the fears stayed. Nights of standing by her bed, days of checking and double checking and checking again. Blame and accusations from the enemy that I could have done something differently, done something better. Anger and hatred toward the sin that could allow someone to do such horrible things to an innocent, helpless child. I knew Beauty. I fought to see Him here. Months later on a Tuesday in the still-dark house, I drank too-strong coffee and I drank of His grace. I prayed over my daughter, a splash of red in the tapestry of our family – feisty, powerful and full of care and compassion. I wrestled with the questions of “what if” and “if only” and I told them of His sovereignty, again. And right there on the worn pages I read Zechariah call God’s people prisoners of hope. And I knew that I hadn’t been. Once more I had become more of a prisoner of overwhelming concern about the trauma of my children’s pasts and shifted my gaze away from what, Who I was really captive to. My flesh wants to shake the head no but I am a prisoner to God who says “Yes!” All of His promises – peace, joy, love, forgiveness, salvation! – they are Yes to me and Yes to her in Christ! Eternity is Yes in Christ. And because of His Yes I can say Yes to all that He gives. Even all that He allows. Hope is my captor – Hope for her healing here which has already begun and hope for our life eternal with Him. Hope that He who began a good work in us is not finished yet and will carry it to completion until the day that He comes and hope that He is coming. The sun peaks over the horizon and dances patterns across the couch. I see with new eyes, a captive of the hope set fully on the grace given me through Christ. I must live my days as this kind of prisoner, because true freedom is only found in being completely captivated by a coming King. She who is always the first one awake pulls a book off the shelf and snuggles up next to me in silence, her nine-year-old lankiness curling up like an infant inside waiting arms. I see hope in her – and I see myself. I kick and I scream and I thrash hard against the Father’s love. I shift my focus and become a prisoner to the panic instead of the promise, and still He says, “mine.” He looks at me, broken, and calls me daughter and ever so lovingly pulls me right back in. I study her face and can’t imagine that I know only a fraction of His love for her as I whisper the prayers of every morning over her heart, “Jesus you bind up the broken-hearted…set the captives free…comfort those who mourn…bestow beauty instead of ashes… They will be called oaks of righteousness, a display of the Lord’s splendor.” I trace the curve of her face with my fingers and praise Him for such resilience and transformation as I have seen in this child. I praise Him for her salvation and the way she is hungrily learning more about Him each day. I want to live as a prisoner to the “Yes.” Remembering all we have seen, we set our hope fully on what we have not yet seen. We place all of our hope and all of our trust and all of our focus on the grace given us through Christ, and we beg to live captured by His promises. I know I have been gone for a while. I think I am just having a hard time expressing all that God has laid on my heart. We are well, and experiencing a season of SO much growth and joy and peace in Him. I am so thankful, and I know that it is in part because of the prayers of so many. Thank you for lifting us up. The Lord put it on my heart today to repost this blog that I wrote a few years ago during a very difficult season. Yesterday during some sweet, quiet nail-painting time, this same little (not-so-little-anymore) one shared with me some of the deep emotions of her heart, and I was once again floored and devastated to think of the way-beyond-their-years experiences each of my children have from their years outside of a safe and loving home. This morning, she bounded into the kitchen, laid her head against my shoulder (is it possible that she is this tall?!) and ask me to tie red ribbons in her hair for school. Red ribbons. To match her red skirt. Isn't He in all the littlest details? He spoke hope over me, and her, once more. And I looked into each one of these young women's faces and saw unimaginable growth and hope and strength in Him. Is there a more devastating love than that we feel for our children? Surely only that which the Father feels toward each one of us. Oh, friends. He is so faithful to us! Wherever you are, whatever impossible, broken situation you are facing, He longs to speak His hope and His favor and His beauty over you. Be blessed as you rest and hope in Him today. Katie, ever since that wonderful say a few years ago that I finished reading your book, you and your girls have never been far from my mind. (I'm hoping this doesn't sound creepy) You make me, and I know many others, strive to be better people and to be closer to God. I would love to be able to be like you, helping and serving those who really need it . You inspire me so much. I'd love to be able to be in a situation like yours. I'm just not quite sure where to start. If you do read this I'm sorry for this rambly message! I hope when you read this you and your girls are all doing amazingly. :) Sending love, hugs, and prayers your way from Texas. Katie, thank you for following The Lord's prompting to re-post this ! Heart & my soul." A prisoner of Hope"
discontentment..... red ribbons or skirts or shoes indeed !!! How Great Is Our God !!! Hope Renewed. What a beautiful post you've shared. I am so encouraged this morning and wanting to live as a prisoner of hope. What a beautiful post - I am so encouraged this morning and want to live as a prisoner of hope. "true freedom is only found in being completely captivated by a coming King." Amen! and Amen! Thanks Katie! God bless you Katie! You have inspired SO many people. (I am one of them) Stay strong in the Lord! I can't wait to see you in heaven, Sister! Oh Katie, thank you for re-posting the moving thoughts of that past time and the newness of today. Tears of thankfulness for this daughter and for the others who are in your heart. And prayers w/tears for you with so big a heart...and such compassionate love. Thank you, thank you, thank you! Thank you, Father, for Katie's post today and the reminder of our hope in You. I need this reminder often. I pray that my son will turn to You and have this hope, too. thank you for sharing these words with another prisoner of hope. i needed them. we are on our way to adopting a 'broken' child and these words were just the reminder i needed for TODAY. so hopeFULL. bless YOU and your family. Katie, Thank you for sharing your life so open and honestly. My husband bought me your book and I couldn't put it down! What I loved most about Kisses From Katie was seeing God at work in your life and Uganda! I think every chapter made me cry with gratitude to Jesus! Thank you, Katie for sharing! Kisses From Katie made me love and trust Jesus even more! Thank you, Katie, for sharing your life so openly and honestly. My husband bought me Kisses From Katie and I couldn't put it down. What I loved most was seeing God at work in your life and Uganda! I think every chapter had me crying with gratitude to Jesus! The book made me love and trust Jesus even more! Thank you for sharing, Katie! Thank you so much. God laid this on your heart for my sake. I needed to re-read this today the way someone starving needs bread. Thank you, and thank you, Jesus. Thank you so much. I needed to re-read this the way someone starving needs bread. Red sash, red shoes, red beads, and red ribbon... Wow, the images just jump off the page/screen! The color red conveys so much, as if to say, "I am here." But sometimes like a stoplight, when we see someone who represents the color red, we come to a complete stop. We stop being drawn to the hurting, oftentimes because the cultural norm is to heed the warning of that color and not come closer. At stoplights, we stop, but with the hurting we should definitely rush forward with abandon as Christ would. Thanks for the insightful (re)post, Katie! I cannot even tell you how blessed I am by the words you write. God is so good and he's given you a wonderful gift. I've been praying for you and am glad you're back, even if it is just for a moment. "I read Zechariah call God’s people prisoners of hope." Thank you for a needed reminder, and a beautiful picture. I check your blog at least daily and was excited to see you post. Thank you so much for letting us see how big God is in your lives. I've missed your blogs and was so thrilled to see a new one this morning! God truly speaks through your writing and experiences, I can always look to your book or blog to find His voice and love. I pray for you and your family all the time, that you would bestow a garment of praise on the people of Uganda instead of a spirit of despair. You will feed on the wealth of nations and in their riches you will boast! I hope to be in Uganda this summer and hearing about it through you has been such a huge blessing. Keep writing! God bless you, Katie, and all your children. Thank you for showing us courage and hope for changing our lives to better match our Lord. Thank you!! Thank you for being such a great Mom to these kiddos. Thank you for sharing your struggles. Thank you for sharing your heart. You are an inspiration, Katie! I had a hard week with much fatigue. I have been weary. I read your re-post and your update, and God broke through. I am his child. I had forgotten how much he loves me. let Me take you home. You write so eloquently ...the words that are in my heart. My son recently asked me where was Jesus when he went through his trials as a baby. (We've dealt with flashbacks for some time yet and the memories are vivid)....where is He when our children are hurting? My answer to my sons sobs was simple--He was holding you ...protecting you from the worst. He says He is a father to the fatherless. Hope is what keeps us persevering, moving ahead, looking to the future to the Hope and Healing that only the Father can bring to our children...hold on...beauty WILL come from ashes! Sweet Katie, I do not know you but live in your hometown of Brentwood! Thank you for your work in that place and loving those in that community. What a blessing you must be. Your words are very inspiring, Katie, even in situations that differ. Your love for your daughters brings such beauty into the lives of those you share with. Prisoners of Hope!!! Blessings and thanks. So good to hear a message from you, Katie. This is such a beautiful post. Thank you for sharing it! I really needed to hear that today. I become a prisoner of the panic. Goodness gracious. Praise Jesus for the hope! Oh Sweet Katie, you can't know what your words of encouragement mean as I struggle to hope and persevere for the hearts and ways of my prodigal sons. Thanks for sharing. Katie, I am praying for you and your family often. My mom stumbled across a video done on you a little while ago, and I fell in love. She was hesitant to show me because I have a very direct calling on my life to missions and she was a little afraid your story would stir me to want to move. Typical mom things. :) God is using your life, Katie. He changed my outlook on many, many things through your book. Thank you so much. Keep living in Him. I pray for you often, dear Katie. Your calling is a difficult, glorious one...and you walk it every day with grace, showing Him to the rest of the world. I would love to hug you one day, and thank you for doing what you can, where you can. And for inspiring us to do the same. God bless you and your girls! Katie, I support you with my prayers and I support my sponsored child with my prayers. You have such a wonderful way with words, pouring your heart into the words that go out to the world. I love you in Christ. Thank you for those encouraging words. I am so blessed, I know that well! But in the midst of the blessing is also great sorrow. I am so amazed and in awe of your life poured out so selflessly. I am humbled. May God bless you mightily!I pray someday to meet you face to face if God wills it. Thank you so much for this. My husband and i are adopting two children right now and lately I have been experiencing an overwhelming fear of everything that they have gone through and all the hurt and healing that will need to take place once we are all united as a family. This is something I needed. A reminder. Hope. Be blessed. Hi Katie! I always cry when I read your blog!! I pray that God may bless you and your family! I hope some day I'll be able to visit you!! I got really inspired by your book, I would really want to visit you some day to meet you and your family and to see what God is doing through you! I am from Brazil and I am a missionary in Mozambique, I have a lot of plans for the future... But I know God's plans are the best!! I love to work with kids and I plan to start a project with kids here in Mozambique in the future when I finish school (cause I'm in 11th grade yet)! But I just wanted to tell you that I've being praying for you, your family and your ministry!! God bless! Some awesome sermons on the power of hope in Christ! I just finished reading your book and was blessed by it. Thank you for putting into words His story for your life. I know that it's His providence that led me to read your testimony, and I cannot wait to find out what He has planned. You're such an inspiration to me, Katie! Thank you so much for blogging and putting up your struggles and spiritual epiphanies. Your life and faith is something I pursue having. God bless you! Bless you, sweet one. And your girls. Hi ! I am portuguese and am reading your book which i find extremely inspiring and full with hope. I am a big admirer of you and your work. God bless you!! Tears, tears of joy, tears of sorrow and tears of amazement at the beauty of your heart and the hearts of these broken girls. Thank you Katie. Thank you for sharing your hope in Christ and for being the mother Jesus wants you to be. I look forward to ever blog you write and I share your story with people I know, almost every day. Katie your words have been a blessing today and a reminder that HOPE is a beautiful thing. May your soul be encouraged and refreshed as you see once again how God is using your constant love for Him to not only bless your children there...but to bless all of us who read your writings!!! Katie, thank you for this post. I needed some hope and encouragement today, and the reminder that "He IS". God bless you and your ministry. I have needed this as I struggle to focus on hope in the life of my newly adopted 9yo son. I've been lazer focused on fear and future, repressed grief and his pre Christ heart. Thanks so much for visiting us here and sharing a piece of your heart and God's Truth! I’ve been reading your wonderful and inspiring book and I’m so happy to know that someone in this world is making a diference… by being the hands of Christ. You probably already know this, but if you ever need any kind of help you have ADRA Uganda http://www.adrauganda.org/ an NGO working in the country with primary health care, education, livelihoods, economic development, emergency and relief management projects and programs. Thank you for witnessing what God has done in your life. I pray that you continue to be a Woman after God’s heart. Hello Katie! I just finished your book last night. We are a foster family in Dallas and will be saying goodbye to a beautiful little girl that looks like she could've jumped right off one of the pages of your book. She has been with our family, and such an important part of our family, for 7 months. I have to truly concentrate to not let the impending loss of her overpower me everyday. Your story of Jane was hard for me to read and I imagine incredibly hard to write as well. Thank you for writing about your hard places. You remind me that I can so hard things too and that God loves my baby girl and will go with her when she leaves. Katie, So love to pray for you and your girls and the ministry God has blessed you and your team with in Uganda. Met a new friend of my daughter in law's, who's parents run an orphanage in Uganda. Love to read what God is doing and what He is showing you. Hope to visit one day, until then am blessed to pray for you all. My prayer for all of us is that God will help us to find our Uganda and to serve Him with all that we are. Katie- I am so grateful to our awesome God and grateful to you for sharing this post. It has spoken directly to me- that even though situations seem "hopeless" our God is bigger. Katie, I don't even know where to start. There is so much to say and not enough years to spill to you just how much you and your faithfulness mean to me. I read your book about a year ago now and it has dramatically changed my life (how could it not?!). I think about all you do and why you do it and those girls and those children and those who had no hope and how faithful you are; every day. I am constantly reminded as I go throughout my day what stories you’ve told and how Christ walked you through those unbearable times. You have fueled a fire in me that is so strong I almost can't stand it. I feel a deep calling to missions overseas and am very excited to go on my first one this summer to the Dominican Republic. It's not Uganda, but everyone has their own 'Uganda' don't they! The way you know and depend on Christ is so intimate and enticing. I pray for that every day. The deeper I know Christ, the more I thirst for those who don’t. The more I can’t sit here in my overabundance. The more I crave to be ever so dependent on the Lover of my soul. I cannot express to you how you have impacted my life, although I did try (^), but I felt most led to say: Thank you. Thank you for your obedience, faithfulness, love, and endurance. Thank you for being the example for our generation. Our young age isn’t something to underestimate. Thank you for bringing encouragement to me. Thank you for everything! I thank God for you and the girls! Always praying, Alecia from Alabama. I am a lot like the girl you described in your book, the girl you were before you left for Uganda. I read your book over spring break and fell in love with your story. I was inspired and felt led to help this amazing organization. I just sponsored a child and i am so excited to receive my packet. Maybe, one day I can make it to Uganda and meet the child God choose for my to sponsor. I have passed on your book to one of my girl friends and she is eager to read. Thank you Katie. Our son was abused by a teacher in his class a few years ago when he was 3. He still has flashbacks from it and it is so painful to feel this hurt as a Mom for your child. We are holding strong on to Jesus with you knowing that God is the author and finisher of our faith and will make all things beautiful in his time. Every good and perfect gift comes from above the Father of lights in whom there is not shadow of turning. I'm sitting in my empty high school classroom in Juneau, Alaska thinking about Uganda, Dubai, Ethiopia, and world missions. A group of students from the school where I teach has been traveling to the other side of the world since leaving here yesterday morning. Today they will be landing in Entebbe and driving to Jinja. God has seen fit to bless me with a remarkable bond with one of the young women in the group, and as a result, my heart and thoughts are traveling with them in amongst the people of Uganda. The desperation over the emotional condition of your daughter that you express in this re-post mirrors the desperation I feel over the spiritual condition of my young friend. I find it nearly impossible to avoid thoughts of doubt that her precious heart will ever be turned to complete, life-renewing acceptance of Jesus Christ. I am confident that her experience in Uganda over the next nine day will changer her life, but I'm longing for a work to be done that I know only God can accomplish. Your writing, both in your book and on this blog, has continued to challenge me and bring me great comfort. I thank Him for the words that bring tears and those that bring clarity and peace. As I pray for the little team of students who are so far from home and the people they will meet in Uganda, and the children they will see at Rock of Ages school; I will also pray for you and your family. As you well know, God is not content to use your family and your life to share His love with your neighbors. My prayer is that we will see his work through you continue to radiate our into this whole world, that the love He has poured out in Jinja will touch the heart of my student. All glory to God. Partnership sounds like a godsend! Katie, your proclamation of gratitude of one "Prisoner of Hope" to another is such a valued reminder as we face our son's 6th heart surgery. I already have seen how our Jesus shows up and leaves His fingerprints all over the hard parts of our story, but fear and anguish steal in as I think of the pain that our son must face and the possible scary outcomes. I will choose instead to dwell in this circle of Hope with you and believe that Jesus will not waste one moment of the pain and challenge. I am always praying for God's outpouring of Grace on you, your family, and your anointed ministry. Megan, I too feel this way. Wanting to serve and love others the way that Jesus intended. After reading Katie's book that desire was even stronger. I became frustrated with where I was at and wanting God to move me to a place where I felt like I could really serve. Then He began to work on my heart and open my eyes to the very thing that Katie herself said. Serve where you are at. God began to show me people all around me whom I could love and serve. For now I am where I am, and I want to serve and love anyone whom God places before me. Allow Him to use you right where your at and be blessed and amazed at what He will do!! God bless! I just finished your book today. What an amazing young woman you are and your precious girls. I will keep you and your girls and the needy people of Uganda in my prayers. I am going on my first mission trip this summer to an orphanage in Mexico. Maybe one day I can visit Uganda. God bless you Katie for all you do! Blessed are those who visit the fatherless and widows in their afflictions. May all the USA and world find strength to obey his commands. May your example cause soul searching of the word daily for all mankind. Blessed is God for his patience to all humanity. Katie, such sweet words from a sincere heart! I so want to be there with you loving those girls! I would love them to death! I've surrendered my life to do what you are doing. God bless you and your home full of girls and if you ever need me.....I await! I read your book about a year ago but still today I am inspired. I think it is great what you are doing for all those girls and needy people. I would love to do something like that for the Lord someday. Your post was beautiful! I love your book and your post. The first time I read it, I started crying because it is such a happy\beautiful story. I am 14 years old and a missionary kid back home in America. You encourage me so much because you have so much faith and a real relationship with the Lord. Your girls are all so beautiful and I love what you do for the people. My mother and I hope to get involved with the community here in the states. My father is now overseas still finishing his work. This is really inspiring! Right now my bible class is reading your book and yesterday we watched a video of you speaking. You're amazing!! I am writing this for my bible class and we are reading your book and i find your story very inspiring and i want to grow up to be a great missionary like you because you know what God's plan for you is and you aren't afraid to take ahoy. I absolutely love your story! We are reading it in my bible class and its amazing and inspiring. Thank you for doing what you do! Katie, thank you for teaching me that helping people out and doing service doesn't have to be boring. Before we started reading your book in my Bible class at school, I was never really into doing service. Thank you for being such an inspiration.In my Bible class at school, we are reading your book. It is so good to hear that God has something planned for me and I cannot wait. You are amazing and you are a great example. I really like your post Katie. I think you are a very amazing person. We are reading your book at school. Your story amazes me and makes my eyes open to all the bad things that happen and go on in those parts of the world and I'm only 14. You made me realize what I want to do with my life and that is help the children all around the world. I've made it my goal to go on as many mission trips out of the country to help not only children but elderly and the middle aged. Thank you so much for opening my eyes. Sending love and prayers from Georgia. I thought that this post was very uplifting and sweet. It was very encouraging and it made me feel very happy to be a child of God. Hey Katie! Wow you are such an inspiration and great job on what you are doing! You are an amzing Christian and this story touched my heart! We love you! You are such an amazing person Katie, I really look up to you. I couldn't have done it myself, leaving my family to enter into a new world. You are so brave, and a good follower to God. Katie, I appreciate everyone of your doings. The Lord has truly blessed you. I Know that every kid that has come to has been blessed. I just want to thank you for the goodness you've left in children's hearts. Katie, I really love hearing about your stories and how they impact your life and your faith. Hearing about all of those amazing stories really opened my eyes and I saw how God works through us to help other people. Since I was little I knew about the Bible and God and Jesus, but I never imagined that they would impact someone's life so much! In Bible class we are reading your Kisses From Katie book and I love it! Whenever we are reading and the bell rings I always want t to stay back and read more! I really love your article. You truly spoke from your heart. My class is reading your book, Kisses from Katie right now, and I really enjoy reading it. I love all of the stories about how wonderful God really is, and how he works with us throughout our lives. I want to grow closer to God, and I think that you are a great example for people to follow. You make me want to get to know God even better, and you show me throughout your blog and your post how incredible he is, and how he also wants to get closer to us. I really appreciate everything you have done for him, and for everyone on earth. I really like your blog entry, and how it talks about how we should be and are "prisoners of hope". This will lets us be free, have our dreams, and become closer to God, by helping others on earth. You are an inspiration for my class and me to continue to grow in faith and to love and serve God. Jesus says that whoever serves other people on earth serve him. I want to serve Christ, and others, and I want to grow in my faith in God. I try to every day, and you have helped my along the way. Katie, what you've done is truly inspiring and its a shame many of us can't quite scrounge up the courage to do something as brilliant as you. It has to be incredibly difficult when the doubts and worries come in and yet you keep going, because you know you are doing the right thing, and the love of those children is so much more than worth it. Not only what you are doing but your ability to put it into words that are so moving and so driven by God is truly inspiring. I know I will most likely never lead up to do something this extravagant, even if it merely seems to you as daily life, but you motivate me rather often, to do my best to help out whomever I can, whilst I can. Stay strong Katie! This is a beautiful post, Katie. Thank you for reminding me of the hope that we receive everyday! Your story is so inspiring to me. Katie, my Bible class is reading your book together and it has been such an encouragement to me! Your faith and trust in God amazes me each chapter! In every situation, you look for how God is working through it and I have started trying to think that way too. God is doing fantastic things through you in Uganda! You are such a strong Christian and I hope to have as close a relationship as you have with God someday soon! I am mom to only one little girl and I struggle to do that well. I read your book and can't tell you what it does to my heart. How I yearn more each day for God. I lost my parents…my dad 3 weeks before the birth of my only child and my mom 2 years ago as my daughter was about to to turn 6. I felt so broken, so hurt, and so alone. Then I read your book and I realized brokeness and hurt are human conditions, and that Jesus came to release us from suffering. I still miss my parents so very much, but because of you and your amazing work, I feel that my healing is more in what I give to others than it is in time or any other thing of this world. Whatever I can give…my time, my effort, my resources, and most importantly, my prayers. And you and all of your family on both sides of the world are in mine. Katie dear, thank you for your words of hope from the Book we love so dearly. I have read your book to my two newly adopted grandchildren, and your story has changed their view of life - God truly does make beauty out of ashes. Prisoners of hope - our take home for the day, for every day. 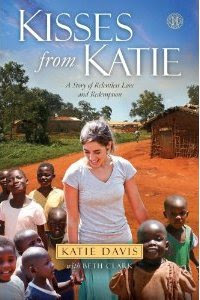 Katie, I am a High Schooler who has always had a heart for missions, and after reading your book my mom and I are coming on a short term mission trip to Uganda in the fall. I want to be used by God like you. Thanks for inspiring us, and so many others. God Bless you and your family! Thank you...just thank you so, so much for this. This is not the first time this week I have read this post. I don't even know what to say to communicate the flood of emotion that hits me as I read your words and am reminded all over again of the greatness and faithfulness of our Father. Thank you for always pointing every one of us to him. Katie, God has blessed you with such a huge heart for His many "lost" children. He has made you His faithful shepherd, guiding you through darkness and danger, to find His little lost lambs. God is truly Great! His work through you is both amazing and inspiring! Please give my love to each of "your" beautiful girls! God is so faithful when we let go and let Him have control over ALL areas of our lives. I pray that you will continue to be filled to overflowing with the Love of Christ as He works in you and through you. Katie, thank you so much for this reminder of Hope. I am moving to Tanzania in a few months and am scared out of my mind, yet i know Christ will sustain. thank you for your book, for your life example, i was a missioanry kid in zambia when i was younger and read your book a few years ago and that rekindled the fire i felt within to go back to Africa. i have been in intercultural studies in bible college for the past 2 years, but i feel the need to go now, even so many are skeptical of me not having a degree in something practical. i find so much encouragement from your book, your blog, and your faith in Christ. thank you for showing all of North America that sometimes education is overrated, and too often we worhsip that over Christ. thank you thank you for showing me that Christ is all i need, and all i will need when i am living in Tanzania, I will definitely be reading your posts in the future and i am sure they will bring much more encouragement! I don't know how you repeatedly write such poignant thoughts in your posts. But you pull it off each time. When I lead new followers to your blog, I just tell them, "If you read this, you'll get to know Him better." That's what you do--- you lead people to Jesus. You are in my prayers! Im Mallory, I dont know you but i might as well from your book :) you have inspired me to grow in the Lord so much in so many ways i cant describe my Bible teacher has heard so much about it rom me so she's reading it to our girls Bible class now, if she wasnt i would seriously read it again I have a tugging in my heart that God has called me to be a missionary, like ever since 5th grade, im now in 7th. I go to a private school in Kansas in no where :) and when I tell my teachers i wanna be a missionary they say that they can see me being one God has been recently tugging at my heart to start reaching out from where i live, and im praying He will show me the way. Im also praying about going on a missions trip this summer I want to more than anything i can even think of! I love the idea of beind a missionary to some foreign country and I cant wait to see where God takes me but it starts now, from where I live from how i treat others at my home, school, church and anywhere if I could i would come see you and your daughters because right now i have just a faint image in my head of what your home and your village looks like. thank you for helping me open my eyes to what God has in store and for helping me grow in Him tremendously through your book! When I am lost in this world of details, I remember to look at your site. Your words, of a poet, hit me afresh as the day I read your book. Be strong, have hope, even though my two daughters want no contact with me. Your pain, so true, makes me feel less alone. I just finished your book this weekend. How I admire your willingness and faithfulness to live in the will of our heavenly Father! And what an inspiration you are not only in your community there but all over the world. God's Blessings on you and your family! I sometimes wonder how it must feel to you, Katie -- writer, mission worker, caring caregiver and mommy to many in a country far across the ocean, to realize there exists a great many out there whom you have never met but who feel they know you from your book, blogs, and YouTube appearance, etc. Yet here we are sisters beneath the skin because and with Jesus, you young, me old and many in-between all experiencing the same grace and literally feasting on the living Bread from heaven, day by day. The love He pours out in such abundance on you, your girls, and other Ugandan folk through you is an added proof positive (a hugely impacting one) of a God who loves us with an abandon we can hardly imagine. Your book, your times there, your story have been life-changing for me and I know as well for many others. I try to pray for you every day that God bless, prosper, sustain, grow, strengthen you, your work, and your babies and through them a nation yet to be. As Corrie Ten Boom said, "Isn't this a little slice of Heaven?" Katie, I am thrilled to see a new post here -- though I understand your days are filled with the more pressing priorities: prayer, the Word, your girls, Ugandan friends, ministry concerns and a myriad of other doings involved in simply ( or not so) just being a mom. Thank you so much for squeezing us in for an update and for making it so poetical. Whenever I pray for you I wonder how things are going: what are your struggles and heartaches, your joys and victories too that we may all rejoice together. Because it has thrown open a window with a view of God’s love literally gushing out in a stream of dynamic force raining down on you, your story has been life-changing for me and I thank God for that. I am reading too about new challenges as South Sudan refugees pour into northern Uganda. May God give you safety along with lasting fruit for all he places in your path. Katie, I am thrilled to see a new post here though I understand your days are filled with the more pressing priorities: prayer, the Word, your girls, Ugandan friends, ministry concerns and a myriad of other doings involved in simply ( or not so) just being a mom. Whenever I pray for you I wonder how things are going: what are your struggles and heartaches, your joys and victories too that we may all rejoice together. Because it has thrown open a window with a view of God’s love literally gushing out in a stream of great force for his work, your story has been life-changing for me and I thank God for that. I am reading too about new challenges as South Sudan refugees pour into northern Uganda. May God give you safety along with lasting fruit for all he places in your path.. I came to your blog today looking for substance. I know I can count on finding it here. Thank God for things we can count on. Over the last 6 months, I have been through the most appalling circumstances...things I would never have dreamed humanly possibly. I have felt like anything but a prisoner of hope. Over this past week I have begun to see rays of hope. And one of the verses that I had to really sit with for a while was the one you shared--that all the promises of God find their yes in Him. I had to sit with it because I was angry at what had been allowed to pass, and I had to make amends with my Creator, and remember that He is good and it's the enemy who is bad. And that my hope is in Him and in His promises. Looking forward to the fulfillment of God's Word in HIM. Dear Katie, I so look forward to your blog posts! I know you are very busy with your children and your ministry but still, my heart leaps when I see that you've posted something new! Like so many others, this post speaks to me. I was an abused child and it was and is my faith in God that has saved me--first from my abusers and then from myself due to much self hatred. As it happens, I am in yet another "dark season" of self hatred. I don't know why. I only know that I have survived it before and that I can survive again. The difference is that with Christ, I NEVER have to go through any pain alone! Thank you for that timely reminder! "Lord, speak to me, that I may speak in living echoes of Thy tone; As Thou hast sought, so let me seek, the erring children lost and lone. Oh! teach me, Lord, tht I may teach the precious things Thou dost impart; and wing my words, that they may reach the hidden depths of many a heart. Oh! give Thine own sweet rest to me, that I may speak with soothing power a word in season, as from Thee, to weary ones in needful hour. Oh! fill me with Thy fullness, Lord, until my very heart o'erflow in kindling thought and glowing word, Thy love to tell, Thy praise to show. Oh! use me, Lord, use even me, just as Thou wilt, and when, and where; until Thy blessed face I see, Thy rest, Thy joy, Thy glory share. May the Lord continue to use you to bring many lost souls into His kingdom! Katie, I just started reading you book today and I'm already halfway through it. Your words have inspired me in more ways than I can express and I just wanted to thank you for all that you have done, and are doing so many people's lives, including my own. I am in awe at your great courage and love for the Lord. Please know that you are in my prayers. Katie, THANK YOU!!! I just found out about your blog, although I've read your book several times. You are such an encouragement to me. Even if you never read this, I wanted to let you know that I am praying for you. I would soooo much like to someday come and see you and your girls... You are such an encouragement to me, an everyday person who has only my life to give, and no huge talent to speak of, just my love and my prayers, and my work. I wish that I could pack up and leave to some far off, dirty little village that doesn't know anything about Jesus... but considering that I'm in 6th grade that wouldn't quite work ;) Thank you for encouraging so many, and for encouraging everyday people, such as me. THANK YOU, THANK YOU, THANK YOU!!!! May Jesus richly bless you, your work, your girls, and all the Ugandan people! Katie, I'm so excited to see a new post here as well! I know life must be extremely busy for you! Just know that you are not only touching lives in Uganda, but you are touching lives here in the States. You are an inspiration to me to live fully as the Father intended me to live through His Son. Praying for you and your sweet children! God bless you for your work, Katie! Your posts give me encouragement! My name is Kathryn Beale and I'm from Benton, Kentucky. My sister, Jordan Beale is 19 years old and to sum up a long story, she felt God's call on her life to go to Bungoma, Kenya (which is right by the Ugandan border) and live in an orphanage. She is currently a Sophomore at Lipscomb University in Nashville, TN and decided to take the semester off to do this. Our family has known a missionary in Kenya for about 15 years now and she originally went there in January just to help him. As she has come to realize, things there are much worse than we ever could have imagined and they basically asked her to take over the Orphanage. There are 22 kids living there who have no parents, and several are HIV positive. Now she has settled down to the daily routine of basically being all the kids' mom until May when she comes back home. Jordan asked me to email you because she really wants to meet you! She has the opportunity to travel to Uganda next week and was wondering if there is any way possible she could meet you on April 10th? It would mean the world to her and I think you would be very kindred spirits. She has decided she wants to adopt a little boy named Oliver, and I think she really wants to get your advice and insight on it. We are all so inspired by your story Katie! THY WORK - TO REST IN ME. Your post touches me so - I will be sharing your message of "prisoners of hope" with the women we fellowship with at a women's prison in our community. It will be a beautiful message of hope to share for Easter. Thank you and may the Lord strengthen you for this ministry of love he has called you to. You probably get a lot of people writing to you about whats on their heart, so I hope, this is not quite the same as those. I go to a Bible college here in Florida and I am majoring in worship ministry, my deco group and I just read your book. I was surprised to find every chapter, had me in tears at the end of it. The reason is this; when I was 15 I had surgery and I was told it is unlikely that I will be able to have children and if I am, it will be difficult. So, adoption has always been on my heart, and my sophomore year of college, God put on my heart to go to Africa, not to do missions or anything specific but just to love on people and bring joy to them. Reading this book, affirms those things God has placed on my heart. I'm encouraged to read your book because, on my own I feel that I cannot do much, but God shows through your writing that He can and will take us anywhere. I don't show my emotions much, I am very emotional but I tend to put my feelings aside, but reading this, I just couldn't help but to cry, in sadness and in joy because of Christ and how He loves. Prisoner of Hope! What a wonderful blessing to have that perspective. Your words touched my heart. I pray that I would hold to that truth today and everyday. I just completed your book yesterday and I have shared it with a friend and my daughter wants to read it next. You have pointed them to Jesus on each and every page in your book and what a testimony to our God as our all in all. Your writing and experiences and your heart have made me want to say "yes" to my savior even in my circumstances that can make it easy to say "now is not a good time". To draw nigh unto the one that holds each of us in his grace and hope. Thank you for your obedience and your testimony of faith. May God use you more and more and may you prosper even as your soul prospers. I don't read as much as I should and when my wife handed me "Kisses from Katie" recently we read the entire book lickety-split! What a gift from God you are and was I ever blessed! I cried more in this short time than I have in prob 10 years combined. You are an amazing witness,example, servant, mother, leader and so MUCH more! My prayer is that you will continue to be the hands and feet of God and would continue to touch those that the world has discarded, but the Father loves so dearly. Katie, I'm reading your book right now, and I am only 12, and I am already considering all the possibilities for me to serve others in the name of our God. My church offers many small mission trips such as feeding the Homeless, which, now that I look back at it, is a big thing for them. When the homeless people come through, every one of them is so sweet. I thought that was all I could do at my age. But this summer, I'm going on a mission trip called SOS, which is an acronym for Service Over Self. We spend a week in the poverty-stricken areas of my town, and help out. You are an inspiration. I read your words, follow His ministry through your life and am jealous. Jealous of dirty, red feet. Jealous of jiggers, stifling heat, beans cooked on open fire. Jealous of your sight of the “real” world outside of fat, happy America. Jealous of the rawness of life that allows you to see so clearly – JESUS. Our hearts are so much the same; perhaps it’s the same Holy Spirit’s inhabitance. I am an elementary school teacher who has had a small taste, in comparison to yours, of an orphan’s life in a third-world country. I have felt the suffocation of returning to our complacent American lifestyle after having witnessed “the least of these” who have joy unexplainable despite their lack of “amenities.” I am a mom of 4, two of which are adopted. I am married to an amazing man, lover of our Lord, who too has desire the size of an ocean to see HIS Kingdom come. My heart is broken for these American children who are drowning in the dense fog of the American Dream, deceived by materialism, blinded by comfort and becoming weaker as each generation passes. God is allowing me to see them just as you see yours. Your words are an encouragement in an ironically opposite “poverty-stricken” situation. A situation where school supplies are in abundance, the latest fashion drives apparel choices, and options for lunch are multiple. These conveniences have created a selfishness that HE has broken my heart over. However, HE is using you here. Because of this urgency in my heart, I am using every moment possible with these public school students to unveil JESUS, to expose his heart for the world. Through following Amazima Ministry, and a few others, the Katie Davis’ and Sam Childers’ (maybe minus the machine guns ☺ ) are arising from this class of 5th graders. I am praying God’s favor to surround these tender hearts like a shield; a shield that will keep them soft, vulnerable, compassionate, tenacious, and protected from the American Dream. Thank you for your boldness. Thank you for your willingness to sacrifice. Thank you for not ignoring HIS prodding. Thank you for the love and joy that you have allowed to abound from your life. Thank you for spending the time, though tired and worn, to write, to honestly share, and to inspire. Though God has placed us on opposite sides of His world, His scarlet thread binds us and maybe one day we will meet and we can lift praise to Him together. May He continue to bless you, keep you, cause His countenance to burst forth from you as you reflect His glory, and may His peace reign over you, permeating every inch of your existence as He goes before and hems you in from behind. I read and reread your book. It really touched my heart. I am hoping to go on another mission trip soon- maybe to Africa this time. I particularly wanted to thank you for sharing this post about your daughter. I am mentoring a young boy (9 years old) who is now an orphan because he was once sexually abused by a parent. We have had a lot of really challenging times together and he is still working through behavior/ emotional impact of the abuse. Your post really encouraged me to keep trying and loving him no matter what. I have felt helpless and hopeless at times about his situation, but as you said, God loves him more than I do and can do more through me than I can on my own, so there is hope. I also know that God put me in his life for a reason, so I'm going to continue to share the gospel with him and pray fervently for healing. Thanks again! Katie I came back here today searching for something to heal my scorched soul. And I found it. Right here in your struggle to see Jesus oveshine the ugly downright gross things that happen on this planet , and now I know that if you canwin that victory when it is closer than your own skin, then I can when I read the words of a man who has experienced so much suffering for Jesus, Richard Wormbrand. I cannot carry this or look it in the eye and I cry out to Jesus isn't it enough Lord, Please come back. Thank you Katie, thank you Lord Jesus for our combined fight to see grace, love, benediction that glory that transcends the shame of our world. King David said he almost slipped once when he saw the wicked prosper. I think I understand. If we allow the around to overcome the inner we could slip. But God says, the Father says he will not allow ou foot to slip. Thank you sweet Katie for sharing your heart, for opening a door to your life that others may also profit and grow in the grace and knowledge of our Lord and Savior Jesus Christ. for anonymous who left the negative comment. first of all Katie never expressed she was a better Christian because she is serving on the mission field. Repeatedly she has said a person can serve right where they are, that the important thing is to listen to and allow Jesus to direct our path in life. Katie could no more do anything other than what she is doing than a bird can stop singing. Don't you think one parent, one person who cares and loves enough to bring an unloved uncared for little girl into a place of refuge is better than none? God can provide someone to come alongside Katie if that is his plan, but we aren't God and it is not for us to say. Anonymous, I feel you are speaking from a broken heart and I am so sorry you feel this way. I know what it means to have adult children right here in the same country and grandchildren that I have little contact with. It is a lonely feeling, but surely if you trust God you know that if it is not his will that your daughter should choose this particular way to serve him he will show her and she will come home to you. But why not take a page out of Katie's parents' life and join your daughter in serving the Lord? In that way you can stay close to her and endear yourself to her as you support and love those kids along with her. We only have one life to live and Katie has chosen to give hers away to Jesus. I am in my 70th decade and I wish I had given myself away more to Jesus. Life is short and we will all face him in the day of judgment with what we have done in the flesh. Maybe all the ones who respond to Katie's blog and book won't as you say go to a foreign country but I guarantee her writings and her life are nevertheless a great encouragement and inspiration and comfort to those who come here and receive sustenance from a young girl that can even mentor an old girl like me. She points us to Jesus and she points us to the scriptures and her very words are a beauty in themselves. I am so thankful that I can pray for Katie and know that many others are also supporting her in prayer. It means a lot. Prayer is our entering into the Holy of Holies with the Father, a place that was barred from Israel but opened up by Jesus. Now as I pray for Katie I will also pray for God to heal your broken heart, remove any bitterness, and bathe you in the amazing love of the Holy Spirit. May you be one with Him and with your daughter as our Lord desires. You have captured my love for The Lord our God more then ever before. Reading through your book kisses from Katie made me think about, not making plans for the future but to instead my my life into God hands. He is amazing and He put me on this Earth for a reason, God knows what He wants me to accomplish on Earth and I will let Him show me the was as He is the GPS of my life and I'm wanting to take those directions. Thank you for opening my eyes just that little bit more. I hope to visit you some day to see what a difference you have made in the world. The plans the Lord has for your children! The way Jesus is walking with them! In your words here, all I see is Jesus loving through you. He is everything, and you are HIS. I loved your book too Katie. It pricked my heart for our hurting world. I have two daughters through adoption, and I love this post. Despite receiving them as two-day old infants, they too have scars and fears that I can't fix with my motherly arms. Only Jesus brings healing. Thank you for sharing! Please post more blogs . I remember this post from two years ago. I'm sorry for the comment I made back then. I don't think was the best thing to say with what you were going through. Thankfully, the Lord placed it on your heart to post it again. And, I am so thankful for the Lord's faithfulness in giving you his hope to hold on to. Your story in your book, Kisses from Katie, and on your blog have touched my life with hope. And, by the grace of God, I too will forever be a prisoner of Hope. I have followed your blog for a few years now, possibly 4, and I am always encouraged, convicted, challenged, and moved by the Father's work in and through you. I can honestly say the Father has used your posts to make me a better follower of Jesus, a better man, and hopefully now, a better husband, as well as a father myself someday. I love your ministry and your blog. Please, continue to abide in Christ and allow him to use you because you are blessing so many people in Christ, many then you may ever realize.